The Douglas XA-2 was a United States prototype attack aircraft converted from the last Douglas O-2 observation plane in the spring of 1926 by Douglas Aircraft. The reason for the choice of nomenclature lay in the prior existence of the Cox Klemin A-1 ambulance plane, and possible confusion caused by the similar designations. There was also an A-2 ambulance plane - a modification of the Fokker T-2 (Type F-IV) - but it had been decommissioned before the launch of the Douglas A-2. While the basic structure of the plane remained, there were several modifications made to better suit its new role as a fighter aircraft. First, the water-cooled Liberty engine (V-1650) of the O-2 was replaced by an air-cooled V-1410 inverted (cylinder heads upside down) Liberty engine. The reason for this was that water cooling system was seen as too vulnerable to enemy attack. The lower engine cowlings were omitted to allow for more cooling air flow over the engine. Second, the A-2 was more heavily armed than the O-2. 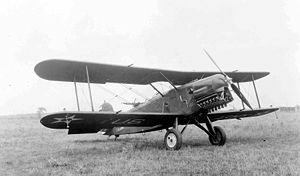 The A-2 had six forward-firing .30-caliber Browning machine guns - two in the nose forward of the cockpit, and two each in the mid-upper and lower wings. Two .30-caliber Lewis guns were put on a flexible mount for use by the observer-gunner in rear defense of the aircraft. The aircraft also had the capacity for a small bomb load of 100 lb (45 kg). The Douglas XA-2 was evaluated against the Curtiss XA-3 (a conversion of the Curtiss O-1B observation plane). The Douglas aircraft won the initial competition, but the Army realized that the Liberty engine was both under-powered and in dwindling supply. It ordered a second competition with both models upgraded with Packard 1A-1500 engines. The Curtiss aircraft won this time and became the U.S. Army Air Corps' front-line attack aircraft (Curtiss A-3 Attack Falcon) from 1928 to 1935.